We know and understand your business and your expectations. We are responsive and available. We do our jobs and do them well so that you and your employees can do yours. Shafer Glazer is a recognized leader in the field of insurance and corporate liability defense. Our firm has not only received Martindale-Hubbell's highest rating of AV Peer Review Rated, but also is listed in the Martindale-Hubbell Bar Register of Pre-Eminent Lawyers in the areas of Insurance Defense, Labor and Employment and Workers Compensation. In addition, A.M. Best has placed Shafer Glazer in its Directory of Recommended Insurance Attorneys. 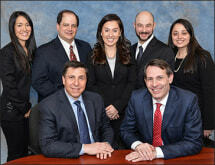 Our lawyers have been recognized as New York Super Lawyers since 2006. Shafer Glazer has extensive experience working with insurance companies, syndicates, captives, risk retention groups, third party administrators, policy holders and large self-insured companies. Because of our depth of knowledge, our attorneys have been invited as speakers for business associations, municipal hearings and continuing education on topics relevant to our clients and insurance companies. Our attorneys hold leadership positions in bar and professional organizations. We provide the best defense possible, while working within company guidelines and maintaining a cost conscious attitude towards defense - without sacrificing quality. We believe that the best way to contain costs is to resolve cases as quickly as possible, whether through settlement, summary judgment dismissal or determining where insurance coverage may be owed by others. Our lawyers work in and out of the courtroom to achieve positive results, believing that a good legal defense requires careful analysis and direction from start to finish. All matters are evaluated at appropriate junctures of the litigation, so that resolution can be considered at each step of the way. We maintain close contact with company representatives to make sure that our plan is your plan. Shafer Glazer is a Your House Counsel Member Firm.